Chicken Blog: Where Was I? This morning I was still trying to sort through the deep thoughts I have had since my "New Year" Post. I got a lot of concerned comments and responses, and it's taken a lot of sorting of feelings, ideas and theories for me to come around to addressing the issues before us. I rather casually mentioned a theme that we have been coping with quite frequently in the last few months: Max is not having a good school year. Our son has a long and unique history, largely related to Asperger's Syndrome or as we put it, with knowing grins, "Geek Syndrome." We have had such tremendous success helping him socially and academically that it's easy to forget that the underlying issues are still present. Except when he starts to experience difficult passages, developmental challenges, rites of passage that seem to derail his steady progress. Interestingly, when he was initially, officially, diagnosed, the therapist sympathetically and sincerely hoped we would consider home schooling Max. She thought it would be the most beneficial way to address his needs. We were already immersed in home schooling with both William and Alex. Keeping Max home, teaching him through patient and targeted methods, seemed like the easiest and most prudent solution possible and we were happy to add him to our student body. Max's introduction to school outside of the home came last year and it was highly successful. With some adjustment he found a new and stimulating environment with new friends and interesting topics to explore. This year has not been so easy. He is resisting and unhappy. His frustration lasts well beyond drop-off time and does not abate over the weekend. Other teachers, parents who know him... they all notice his sadness, his withdrawn mood, his lack of interest. It is confounding and frustrating for us, as his parents, that when he is in a symptomatic-Asperger state, he is extremely difficult to communicate with. He reacts to stress, anxiety and frustration by either shutting us out completely or acting with irrational anger and aggression. Gleaning information, finding clues about his turn around, his waning interest in school and friends has been slow and mostly inconclusive. However, during the break we had some insightful break-throughs and glimpses of our happier, relaxed, confident Max. It seems that time in his home, on familiar ground, with our own rhythms and projects was a benefit to him. We aren't the only ones that noticed the difference in his mood and behavior. It was confirmed that he was a different child by parents from school we met during the break. Max has a wonderful teacher. Really. 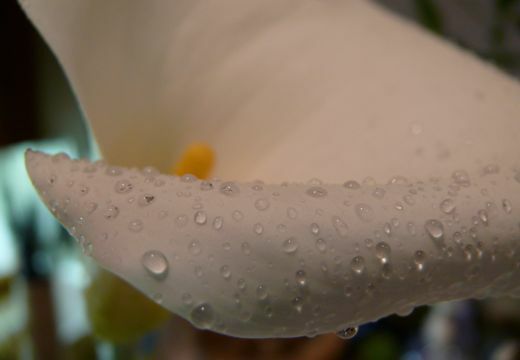 I feel so grateful to her, for her concern, for her understanding, for her willingness to approach Max with a tremendous compassion for his way of seeing the world, and she has done a considerable amount of adjusting her program to fit his needs. I could not find a more ideal situation for him, and yet she and I both have been drawing the same conclusion: Max may be better off returning to home school. His teacher thinks he benefitted from what and how he learned at home, and she believes he could continue to benefit from learning at home. Hearing this came as a surprise, and it was a pleasant affirmation. It seems that while he is in a wonderful environment, one that he willingly agrees he wants to return to next year, it is possible that where he is at emotionally, or in his development, requires a different approach. Knowing that home schooling has been a proven success for Max, I have fewer doubts about bringing him back home. I am less concerned about him missing out on typical grade school experiences, especially when at this time he seems to be regressing and losing academic and social ground, rather than excelling in school. When our children have special needs, we learn so much... so much more about being receptive to finding a different approach, to looking at predicaments with perhaps an unexpected perspective. Whatever concerns or doubts I might have about making a change are negated by the realization that another year of learning at home may preserve his love of learning, his confidence and curiosity, and those are vital and precious to his education. No school or program will be of any use if he continues to doubt his own abilities. There. I've said it. I am probably leaving out all kinds of details, supporting evidence, anecdotal affirmations etc... but sometimes we just have to see the path and start walking. While I have been grappling with evidence and options, paths and destinations, and other deep thoughts, I have also been meditating with fabric. Maria's kitchen suffered in our lead paint purge, and I have been meaning to find a fun, creative and acceptable alternative to painted wood food and questionable plastic foods. Ta-Da! With imagination and fun stitch patterns on interesting fabric, you can have an entire fabric menu! Bacon and eggs, for example. And though I am allergic to soy, you are welcome to imagine those are soy strips! Naturally, the strawberries are organic. I am looking forward to adding corn, carrots, tortillas, tomatoes and french fries to the line-up. In the meantime, I am happy to report that Maria finds these a happy and very acceptable alternative. Even the "broccoli tree." One more thought: Thank you. Thank you for sharing your concern, your thoughts and feelings. Feedback and comments are such a wonderful gift, and I really appreciate hearing from you. It helps to face the world with encouragement and other points of view. Congrats on seeing clearly what need to be done to help Max move ahead. Your thoughts on what he needs at this time in his development to preserve his love of learning are so insightful. Maybe he can try school again when he has successfully gotten through this tricky time. Please tell Max his cousin Griffin in Wisconsin misses him. "COTTAGE INDUSTRY" Seriously your fantastic quilted food is amazing. I was just talking to Mom about starting a doll quilt business but that we needed to discuss this with you since you were up on the doll quilt trend. Now wouldn't doll quilts and quilted food bring in millions? We have to jump on this though...lol I am serious. I tried to find toys that were not made in China over Christmas and it was near impossible. I am sure many parents & grandparents would buy your non toxic food, especially with cute little Maria in the ads. Big hugs Natalie. Bottom line, you know what Max needs at this developmental milestone. Being a homeschooling parent, I know it can be a touchy subject on both sides. Now, that food looks enough to eat! So super cute. I bet Maria is thrilled. Love and hugs to you and Max. Lots. The right things will happen. Forward and onward. I don't know anything about educating children but it does sound like homeschooling is the path for Max. For whatever reasons, some children just don't thrive in a classroom. It's very strange that I, childless, most enjoy the blogs of those with children, and somehow a lot of my regular reads have been involved in homeschooling - it really seems to be growing - or Steiner/Montessori education, and I have one blog writer with an Autistic child. My siblings and I just went to school everyday, some of us did better than others but it was all 'normal'. I think I've become more and more interested in alternatives since being introduced to blogging - there is so much to learn about! Apologies for going on a bit. I too love your fabric food - it's wonderful. Myself, I'm into crochet and knitted foods, they make me laugh. I'd love to make something for Maria if you would allow it. I whole heartedly agree with Carol! I say cottage industry here you come. Your food is great. I think she is right, finding things for our kids that are not made in China is fantastic, but difficult! I know of a community here in MI what would probably love to market your stuff. I think you are making a wise choice for Max. Sometimes re-evaluation is an important and necessary thing. We have a school near us for kids with this disorder too. It is so difficult to know what the "right" thing is and sometimes it is right for now and that's ok too. I have 2 sisters and both are handicapped. I know it was difficult for my mom to know what to do and where to go to get the help they needed especially back in the day. Hang in there, we are keeping you and your family in our prayers! 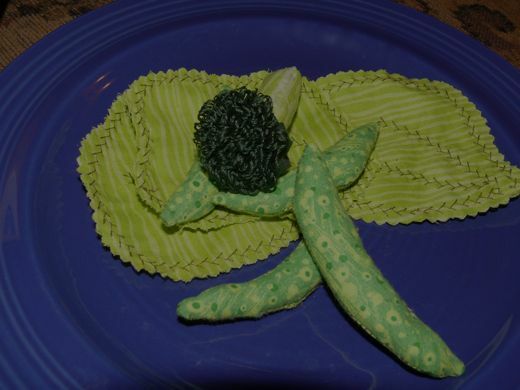 Your fabric food creation for maria ROCKS!!!!!!!!!!!!!!!!!!!!!!!!!! Fabric food A+. Selling it - an even better idea. Courage and wisdom to follow this through - a given. I have complete faith in you Natalie. As does Max. Follow your instincts. I too have a daughter with learning disabilities, a syndrome and autistic tendencies (aged nearly 19) and I wish we'd had the courage to move her in and out of schools when she was unhappy. We only did it once, but the benefits were huge. Wish we had such an option now she has finished school, but....one door closes, so just waiting for the next to open ya know? Here's to the next door opening near you and your Max. 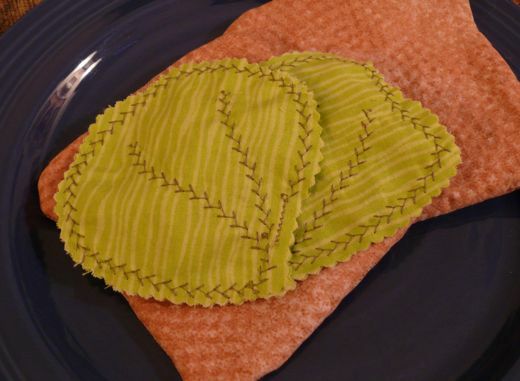 I agree that you should market your fabric food!! Check out hyenacart.com. You would be a perfect fit over there. Natalie, I'm so glad you have found a good solution for Max at this stage in his life. And I absolutely love our solution to Maria's fabric food - they're absolutely enchanting. The "fabric food" for Maria is AMAZING. Creative/resourceful, safe, and fun! You are amazing, Natalie. 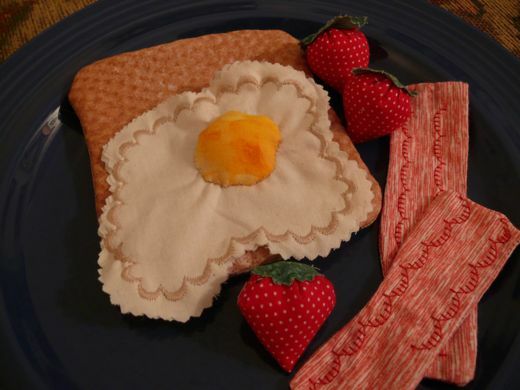 OMG NATALIE... your fabric food is stinkin' awesome! And you didn't mention it, but I suspect it's cholesterol free as well! Sigh. I wish you had a books. All your beautifully written words, your works of art, your stunning photos.... you need to write a book!! !